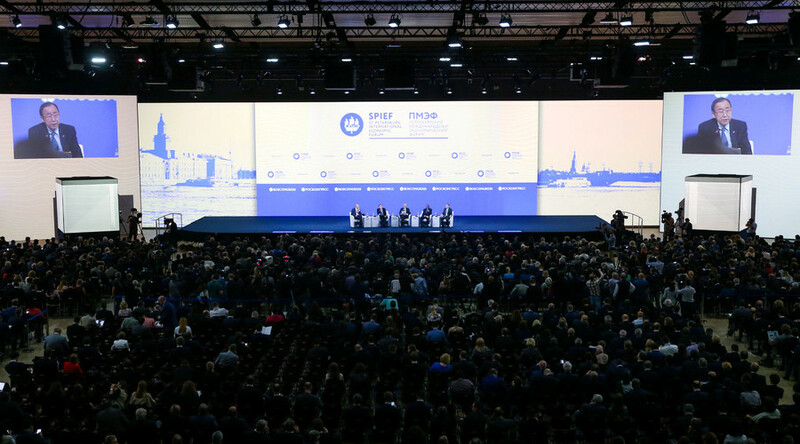 The 20th International Economic Forum in St. Petersburg has kicked off. Political and business leaders have come to sign new contracts and agree deals. RT.com will keep you updated on the main events. Russia's Mir (World) payment system is a young and ambitious project aimed at protecting the interests of the Russian people, which is certain to occupy a worthy place among other payment systems this year and then assume a leading role, Sergey Radchenkov, sales manager of the National System of Payment Cards (NSPC), said in an interview with RT. The card is to perform a wide range of functions going beyond financial services to welfare and transport spheres and loyalty programs. 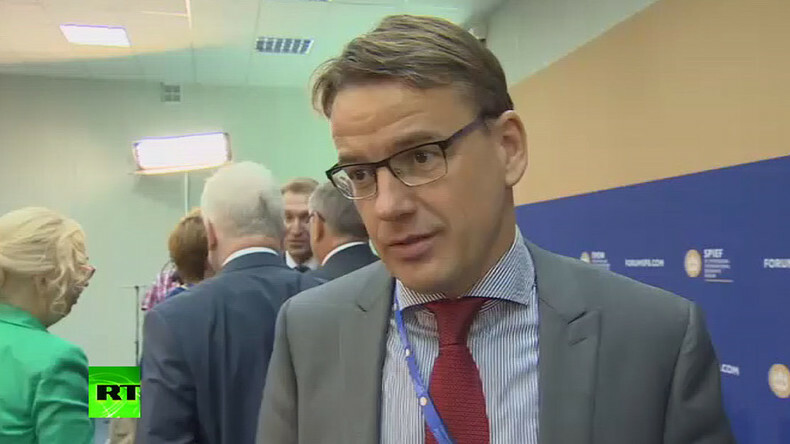 The EU leadership has to realize that sanctions against Russia are an “absurd mechanism” that does more harm than good, said the CEO of French trade and services firm CIFAL, Gilles Remy. However, Remy said he was not optimistic about the sanctions being lifted in the near future. “I think that due to the ineffective work of European institutions, a consensus will remain and some countries, that are peripheral from the economic point of view, will make sure that the sanctions are renewed,” Remy told RT. Italian Prime Minister Matteo Renzi urged Europe and Russia to make an effort to restore their relationship. “It is obvious that there are some problems in the Europe-Russia relationship, and it is clear that each of us has good reasons to think about the past, about why these problems occurred,” Renzi said. Rosneft has agreed to sell a 23.9 percent stake in oil producer Vankorneft to a consortium of Indian companies. The deal is expected to be closed after getting governmental approval. Vankorneft is a subsidiary of Rosneft and was set up in 2004 to develop the Vankor oil and gas condensate field in north eastern Siberia. The Vankor field is the largest oil and gas field discovered and brought into production in Russia in the last 25 years. Russia is ready to again cooperate with Europe, says Vladimir Putin. “We do not hold a grudge and are ready to meet our European partners halfway,” the president told the forum. Putin pointed out that the EU remained a key Russian partner, despite the recent problems. “European business is willing and is ready to cooperate with our country,” he said stressing that Russian authorities are not indifferent to the European economy. By 2026 China's Alibaba e-commerce platform will be able to deliver goods worldwide within 72 hours, company founder Jack Ma said at SPIEF. Many investors from different parts of the world attending the forum are a good sign, says UNECE Executive Secretary Christian Friis Bach. “And here I think the companies are voting with their feet and their minds and their actions and they are telling us ‘we need to cooperate, we need more economic integration across borders and we need investments across borders, we need more trade, we need more transport, we need more transit and more tourism’,” he told RT. Mr. Bach added that it was a good sign for the UN as well, as the organization aimed to provide help states cooperate. Lukoil is in talks with Shell and Total over jointly working in Iraq, CEO Vagit Alekperov told TASS. “We are discussing changes to our contract to expand beyond the West Qurna-2 oilfield… We are in talks with Shell and Total to create a refinery. Iraq supports our efforts,” Alekperov said. Lukoil has significant stakes in Iraq, including a stake in the hard to reach crude in West Qurna-2.